Since moving to the West Village last December, I’ve felt a little like Goldilocks in The Story of the Three Bears. Instead of a bed though, I’ve been looking for a place to make my neighborhood go-to, my spot if you will. I’ve tried coffee shops, wine bars, and all sorts of eateries, from greasy Chinese take-out to homey Italian to sushi directly below our apartment and yet nothing’s felt exactly right. That is, until Buvette, which might just be the one, the one that’s cute and charming, has good food, wine and coffee, and feels right whether I’m alone at the bar with a book or at a small corner table with the beau. On my first visit I had this tartine, which I’ll admit I didn’t think would be more than a snack, but ended up being pretty filling and a great lunch. 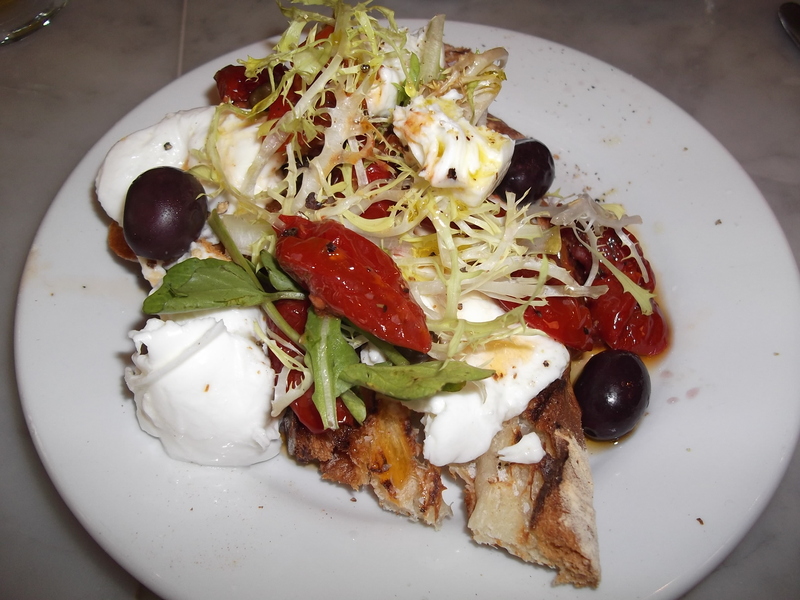 On top of the crunchy toasted bread were creamy blobs of mozzarella, juicy, tart sun-dried tomatoes, soft, purplish-colored olives and a crisp, almost bitter green mixed in. For dessert on that first time, I followed up with the spoon bread, if for no other reason than because I had no idea what spoon bread was. It turned out to be a delicious carrot cake-like dessert, served with in a rammekin and topped with a small mountain of a thick, rich, cream cheese frosting. 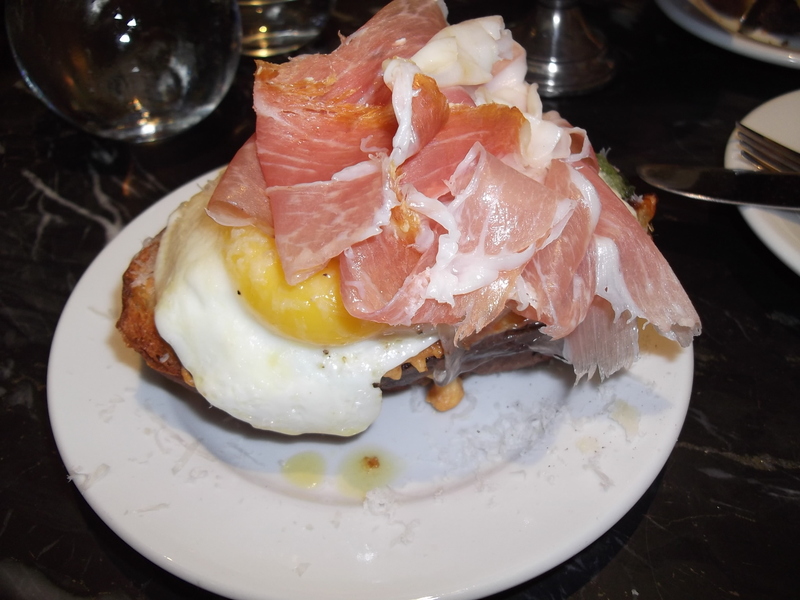 On my most recent visit, I had the ridiculously good Croque Madame, a neat little stack of crunchy toast topped with a fried egg, buttery ribbons of prosciutto and a sprinkling of parmesan. When I poked the fat, orange center of the egg peeking out from underneath the ham, it erupted with runny yolk oozing over everything. My mouth is watering as I type this. Torture, I tell you, torture. 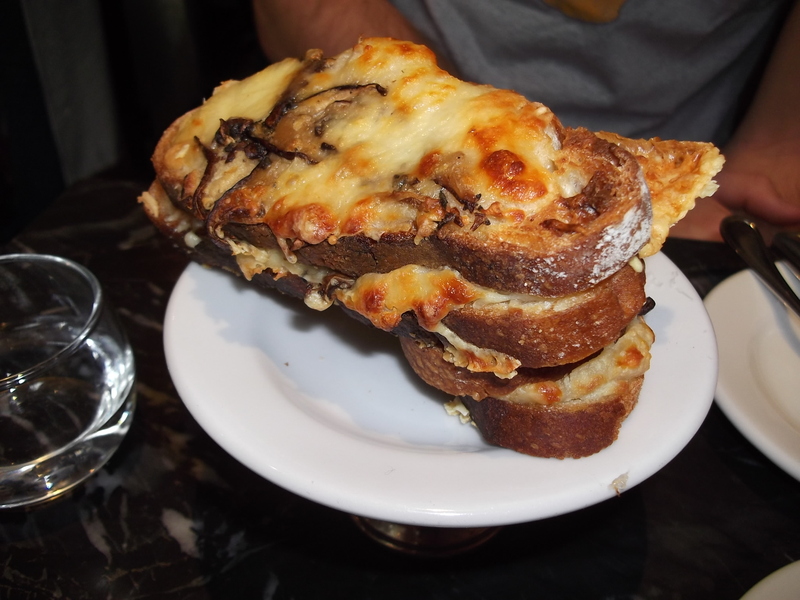 Flaneur, who I couldn’t wait to take to Buvette, had the Croque Forestiere, a mini tower of pieces of toast smothered in gruyere and mushrooms, browned to a warm, golden crust. This would be amazing for breakfast, lunch or dinner… or even all of them all in one day. 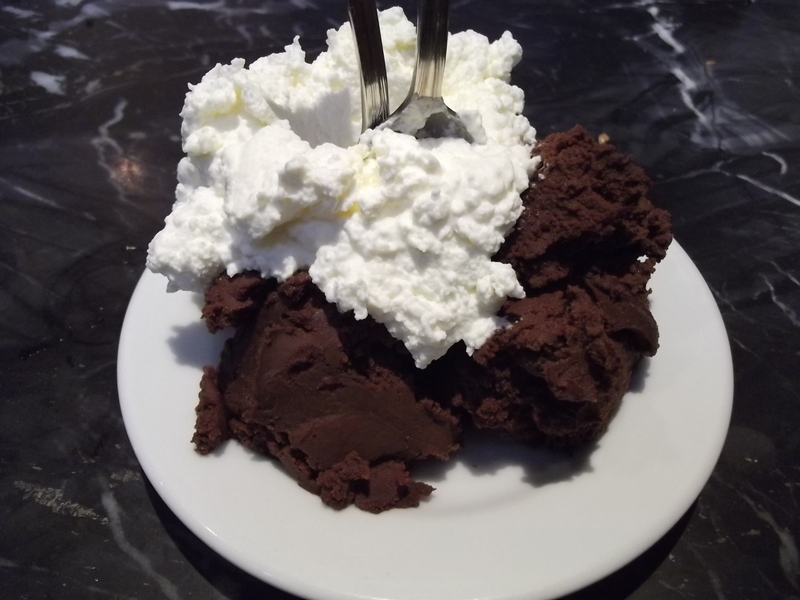 Finally, because my sweet tooth always has to have the last word, we split the chocolate mousse, a seemingly shapeless, fat scoop of chocolate mousse with an equally haphazard but generous dollop of whipped cream. It might not have looked like much, but man, was it good. The chocolate was not as airy as other mousse desserts I’ve had but instead was thicker, richer, the perfect dessert to share. 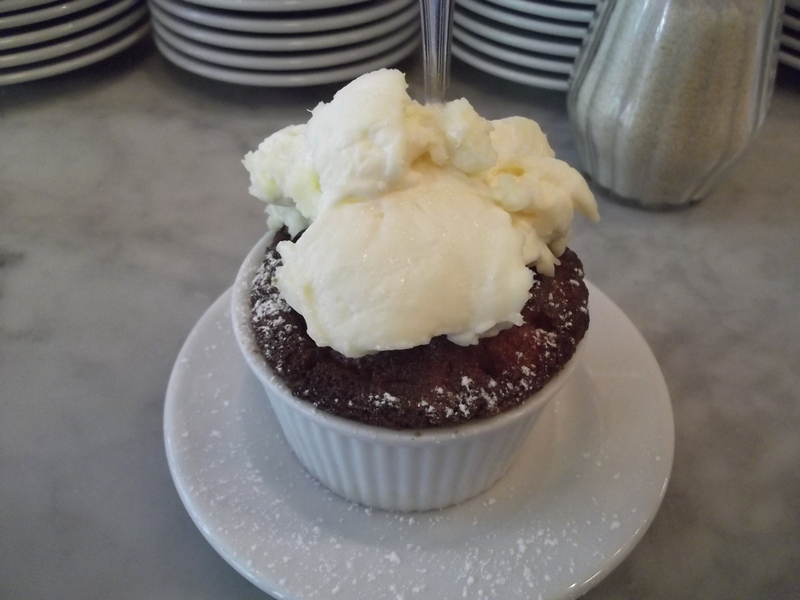 The whipped cream, which tasted home made, was only subtle in its sweetness, perfect for the chocolate to shine through in all its delicious glory. I’ve been there a couple of times now and every time I go, I start thinking about when I can go back again. I want to spend whole afternoons there in my new spot, washing down croques with fresh lemonade, letting the day slip into night while I sit snug as Goldilocks taking a nap in a bear’s bed.